Szafnauer has experience with several Formula One teams including British American Racing, Honda, and Force India. He's currently serving with the latter team, as Chief Operating Officer, and representing owner Vijay Mallya on occasion. In between his race activities, Otmar found time to create a live timing app for digital devices which became the official F1 app in 2009. Otmar Szafnauer was born in Romania but moved to the US in his childhood. He took his degree in engineering in the States and joined Ford. While he was at the automotive company, he went to racing school and started driving in Formula Ford, with limited results. 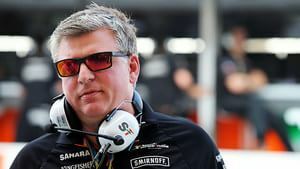 His experience at Ford allowed him the chance to move to British American Racing, where he became Director of Operations at the Formula One team. He left BAR to join Jaguar but didn't actually manage to join the team before a reshuffle curtailed his contract. Instead, he moved to Honda where he stayed for seven years. He left the team in 2008, and moved to a completely new industry - app design. Creating an F1 live timing app with his company Soft Pauer, Szafnauer had some success with the technology. The urge to get back into F1 never left, however, and he joined Force India as Chief Operating Officer. He was instrumental in helping the team improve their results, as well as forging strong relationships with their sponsors and partners.